Reference number for this case: 28-Dec-54-Paris. Thank you for including this reference number in any correspondence with me regarding this case. It was taken by one Paul Paulin, generally incorrectly dated from 1954 by other sources, and considered a fake in the "FOTOCAT" catalogue by Spanish Vicente-Juan Ballester-Olmos. 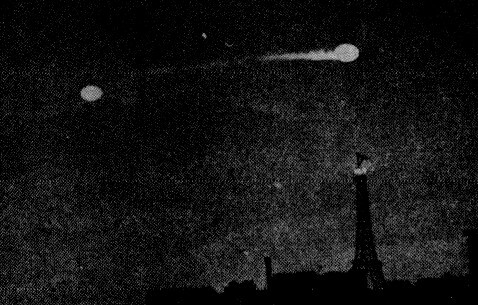 The author indicates that on December 28, 1954, at 03:45 a.m., in Paris, Mr. Paulin saw in the sky, between the Eiffel Tower and the Parc des Expositions, at a height that was not easy to estimate, a disc emitting a bluish phosphorescence. The object was motionless. Having a camera, Mr. Paulin took a picture of the object, giving the film an exposure of two minutes. In this time, the disc slowly shifted to the right. The disc appeared to be studying the center of Paris, then vanished at very high speed. The Observatory had no comment to make. The year 1953 ends with a major observation. In the night from December 28 to 29, at 3:45 of the morning, Mr. Paul Paulin, engineer, noticed in the sky of Paris a very brilliant gleam. He first of all thought that it was the beacon of the Eiffel Tower but, amazed, he quickly realized that it was not this. The beam of the beacon continued its rotation, sweeping the sky of its luminous finger while the "thing" was immobilized between the Eiffel Tower and the Parc des expositions. Mr. Paulin installed his camera and promptly set the aperture at 3,5 for a two minutes exposure. During the shooting, the machine, of a bluish phosphorescence, made a jump and was immobilized again (see illustration n° 12 [Actually 6]). After a short moment, the discoid apparatus departed and disappeared at high speed. This document is the best obtained so far in France. The setting being two minutes, if it were a fake, the luminous cone of the beacon would have been "caught" on the negative one. The angle swept by the projector should have produced a luminous triangle starting on the basis of the top of the Eiffel Tower and being spread out from the first luminous spot (saucer in the first position) to the second (saucer in second position). Nothing of all that is visible. This document can thus be recognized for authentic. Illustration #6 -- Photograph of a luminous disc caught in Paris by Mr. Paul Paulin, engineer, on December 29, 1953, at 3:45 of the morning. During the 2 mn exposure, the discoid machine which had been immobilized made a jump and was immobilized again, between the Eifel Tower and the Parc des Expositions. The photograph clearly shows the luminous trail produced by the displacement of the lenticular apparatus. 1953 - Paris, France, Eiffel Tower. 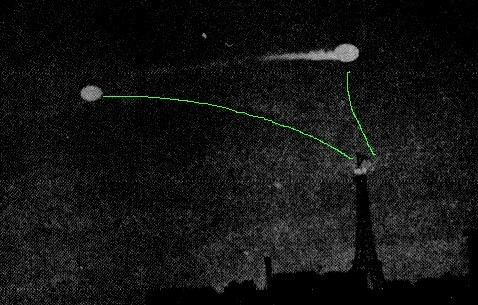 Double discs are seen passing over Eiffel Tower at 3:45 AM, in 1953 as M. Paulin took this picture. The photograph is from the Michael Mann collection and was published in TRUE Magazine at the time. A very interesting photograph, and not a bad one considering the time period, and the distance from camera to object. Look at the original image to see the two objects over the Tower. The reasoning of Jimmy Guieu is fishy on one very big thing at least. If this " machine " were not the aeronautical beacon of the Eiffel Tower installed a few time earlier, in 1952 (below), how is it that it is not visible on the photograph, in addition to the craft, with this exposure 2 minutes time? My interpretation is that it was actually the Eiffel tower beacon, illuminating a cloud layer. Indeed, I see the possibility of tracing its trajectory. I think that the beacon passed from one position to the other alternatively. At the second position; which it (the so-called machine) had just taken at the end of the exposure, we do have the luminous trail connecting it to the first position. And if I look at the image well, I see the weak traces of the two sides of the sweeping of the lighted cloud between the two positions. [---] Article in the national newspaper France Soir, Paris, France, January 31, 1954. [---] Article in the foreign newspaper Corriere Lombardo, Milano, Italy, February 1, 1954. [---] Article by Larry Robinson and C. H. Gibbs-Smith, in the ufology magazine Flying Saucer Review (FSR), U-K, Volume 2, #2, page 7, March/April 1956. [jg1] "Les Soucoupes Volantes Viennent d'un Autre Monde", book by Jimmy Guieu, Fleuve Noir publishers, France, page 151, 1956. [jg1] "Flying Saucers Come from Another World", book by Jimmy Guieu, English version of "Les Soucoupes Volantes Viennent d'un Autre Monde", Frederick Muller publisher, page 140, 1956. [hw1] "Flying Saucers Uncensored", book by Harold T. Wilkins, Pyramid Books publisher, U-K., page 259, 1954. [jg1] "Les Soucoupes Volantes Viennent d'un Autre Monde", book by Jimmy Guieu, Omnium Littéraire publisher, France, page 151, 1969. [---] "Obbiettivo sugli UFO", book by Gianfranco De Turris and Sebastiano Fusco, Mediterranee publishers, Italy, page 113, 1975. [---] "UFO: Nazi Secret Weapon? ", by Mattern-Friedrich, in Samisdat, page 137, 1975. [---] "U.F-O.s, Shooting Star", by R. Jackson, page 29, 1995. [---] "UFO Investigation", book by Reuben Stone, Blitz publishers, USA, page 29, 1993. [---] Dossier OVNI, Orbis publisher, #24, page 118, 1997. [jd1] "UFOTO", listing by Jean-Philippe Dain, France, circa 2000. [---] "UFO'S Nazi Secret Weapons? ", book by Mattern Friedrich, Christof Friedrich, Commander X, Inner Light - Global Communications publishers, 2012. 1.1 Patrick Gross December 20, 2016 Additions [bb1], [jg1], [jd1], [uc1], [bo1]. Addition of the Summary. Explanations changed, were "Not looked for yet."